Christopher Marks, University Organist at Syracuse University 1999-2006 and now at the University of Nebraska, Lincoln, presents his discoveries of lesser-known and new works on the famous 1950 Holtkamp 3-73 incorporating much of the pipework of the previous Roosevelt organ at Crouse College Auditorium. David Johnson, composer and Syracuse University Organist 1967-69, captures in written form the spirit of his prodigious improvisatory skills in the Fugue à la Gigue, composed during his tenure. Nicolas Scherzinger composed these five short works for a 2003 concert series at Syracuse, where he is on the faculty, and they were premiered by Christopher Marks. 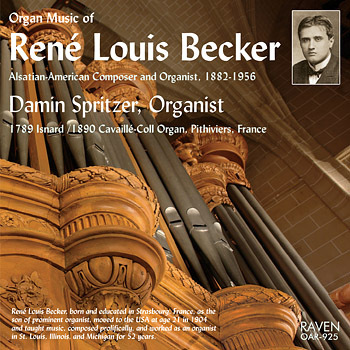 As Scherzinger’s first pieces for organ, they are pleasantly unusual, each using the sounds and capabilities of the instrument in a different way. Each is a world unto itself, often taking two or three simple musical ideas and combining them to make a more complex structure. Joseph Ahrens (1904-1999), an extremely prolific composer, seems all but unknown outside his native Germany. This charming set of variations on the well-known Pentecost hymn was written in 1947 and is clearly grounded in the modality of Gregorian chant, the linear nature of which was of particular interest to Ahrens. The austere, spacious, and deeply spiritual nature of these settings is true to the Gregorian origins of the melody while existing within a modern idiom. Lesser known works of better known composers complete the very interesting program.